Japan can book their place at the 2011 Rugby World Cup and clinch the Asian Five Nations crown by beating Hong Kong in Tokyo on Saturday. Victory for the Brave Blossoms at the Prince Chichibu Memorial Stadium will see them maintain their proud record of qualifying for every Rugby World Cup with John Kirwan's side set to join Pool A alongside hosts New Zealand, France, Tonga and Canada. The defending champions go into their final Asian Five Nations game on the back of a huge 101-7 victory over Kazakhstan in Tokyo last weekend which gave them a six point cushion over Hong Kong at the top of the standings. And Kirwan is excited by the prospect of completing the job qualifying for the tournament in his native land. "[The] Rugby World Cup is the pinnacle of the sport," the former Italy coach said. "It is certainly the ambition of this squad to qualify for the 2011 tournament in New Zealand. Everyone understands the importance of winning the match against Hong Kong on Saturday and it certainly has not been hard motivating the team." 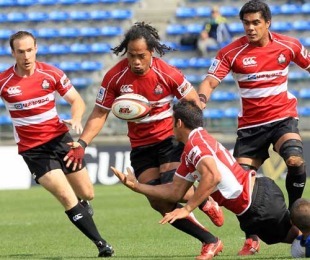 It is still mathematically possible for Hong Kong to finish top of the standings if they defeat Japan with a bonus point and deny their hosts a losing or try scoring bonus point, but that prospect looks unlikely. Kazakhstan retain hope of catching Hong Kong for the second spot as they travel to Korea but require a bonus point win. The second placed team face a cross-continental play-off against Uruguay in July. The winner of that clash will play off against Romania or the winners of Ukraine v Tunisia for the final World Cup spot alongside Argentina, England, Scotland and Georgia in Pool B.
Japan Rugby Football Union Chairman Nobby Mashimo, who presided over his country's successful bid to host the 2019 Rugby World Cup, believes rugby is gaining ground on its rivals in Asia. "These are certainly exciting times for Rugby in this country," he said. "The awarding of Rugby World Cup 2019 to Japan, the IOC Rugby Sevens decision and the IRB Tours schedule will provide the framework for the sport to continue to grow in popularity, profile and participation across the country and in Asia."